Alpha-fetoprotein (AFP) is a glycoprotein of 590 amino acids containing 3.4% carbohydrate content with a molecular weight of 61,000 - 75,000 Da. AFP is normally produced in the developing embryo and fetus by the fetal yolk sac, the fetal gastrointestinal tract, and eventually by the fetal liver. In humans, AFP levels decrease gradually after birth, reaching adult levels by 8 to 12 months. Normal adult AFP levels are low and AFP has no known function in normal adults. The biologic role of AFP has not been defined yet. 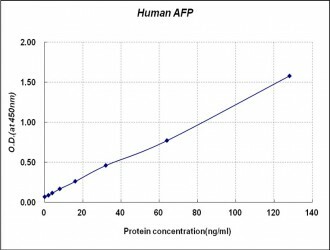 Because of its biochemical similarity to albumin, it has been postulated that AFP could be a carrier protein. It may have an immunoregulatory function during pregnancy. Increased serum levels are found in some tumors, such as hepatocellular carcinoma (HCC), hepatoblastoma, and germ cell tumors. Although total AFP is a useful serological marker for diagnosis of HCC, the false-negative or positive rate with AFP level is very high. AFP-L3, an isoform of AFP which binds Lens culinaris agglutinin, can be particularly useful in early identification of aggressive tumors associated with HCC. AFP mRNA, the circulating genetic markers, also has been used in monitoring distal metastasis or postoperative recurrence of HCC.